Notes for motion in a plane chapter of class 11 physics. Dronstudy provides free comprehensive chapterwise class 11 physics notes with proper images & diagram. How to Locate Points in Space? A frame of reference is another name for the particular coordinate system with respect to which we are making observations of physical phenomena. A scalar quantity requires only a number for its complete description. Mass, volume, density, pressure and temperature are all examples of scalar quantities. The mathematics of scalar quantities is the ordinary algebra of numbers. Vector quantities require both magnitude and direction for its complete description. 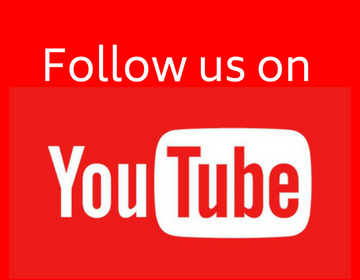 Velocity, acceleration, force and momentum are the examples of vector quantities. 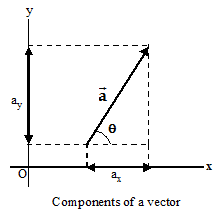 A vector can be represented graphically by a directed line segment. 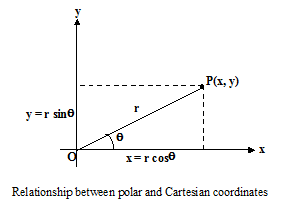 The length of the line segment represents the vector's magnitude and its angle with respect to some coordinate system specifies its direction. We will represent vectors by bold face type letters, with an arrow over the letter such as . When written by hand the same representation may be used. The magnitude of a vector will be represented by italic type letters such as a, b, c etc. If two vectors have the same direction, they are parallel. If they have the same magnitude and the same direction, they are equal, no matter where they are located in space. The negative of a vector is defined as a vector having the same magnitude as the original vector but the opposite direction. When two vectors and have opposite directions, whether their magnitudes are the same or not, we say that they are antiparallel. Two vectors and may be added geometrically by drawing them to a common scale and placing then head to tail. The vector connecting the tail of the first to the head of the second is the sum vector . Vector addition is commutative and obeys the associative law. It is a common error to conclude that if the magnitude of should be just equal to the magnitude of plus the magnitude of In general, the conclusion is wrong; one can see that c < a + b. The magnitude of the vector sum depends on the magnitudes of and of and on the angle between and Only in the special case in which and are parallel; the magnitude of equal to the sum of the magnitudes of and By contrast, when the vectors are anti-parallel the magnitude of equals the difference of the magnitudes of and . where is the angle from the positive direction of the x axis to the direction of The algebraic sign of a component indicates its direction along the associated axis. 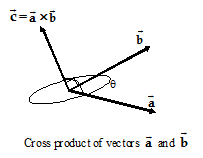 Find the components of the vectors and as shown in the figure, if a = 2 units and b = 3 units. 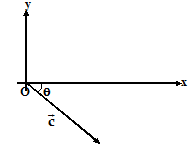 Find the magnitude and direction of the resultant vector where and are vectors shown in figure. There is one slight complication in using equation to find Suppose m and m; then But there are two angles having tangents of -1, namely 135° and 315° (or -45°). In general, any two angles that differ by 180° have the same tangent. To decide which is correct, we have to look at the individual components. 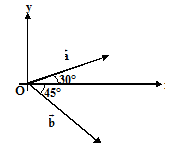 Because ax is positive and ay is negative, the angle must be in the fourth quadrant; thus = 315° (or -45°) is the correct value. But if instead we have ax = -2 m and ay = 2 m, then the correct angle is 135°. Similarly, when ax and ay are both negative, the tangent is positive, but the angle is in the third quadrant. One should always draw a sketch to check which of the two possibilities is the correct one. where is the unit vector along the z-axis. (b) Find the magnitude of and its angle with x-axis. The product of a scalar b and a vector is a new vector whose magnitude is b and whose direction is the same as that of if b is positive, and opposite to that of if b is negative. To divide by b, multiply by (1/b). In which is the angle between the directions of and . The scalar product may be positive, zero, or negative, depending on the value of . A scalar product is the product of magnitude of one vector and the component of the second vector along the direction of the first vector. 2) It is distributive over addition and subtraction i.e. 3) If and are perpendicular = 0. In which is the smaller of the angles between the direction of and . the direction of is perpendicular to the plane defined by and and is given by right hand rule. where is the unit vector. The vector is directed perpendicular to the plane formed by and The direction of vector may be obtained by using the Right Hand Thumb Rule. Stretch all the fingers and thumb of your right hand such that they are perpendicular to each other. Now align your hand such that its plane is perpendicular to the plane formed by vectors and . Align the stretched fingers along the direction of the vector written first in order i.e., in this case . Curl the fingers of your hand towards the second vector through the smaller angle. Then, the direction of the thumb gives the direction of the cross product.